Following the explosive rise of their price and popularity, cryptocurrencies have inevitably come under increased scrutiny from governments and various regulatory bodies. Since then, crypto enthusiasts have paid special attention to how each of the many authorities around the world views digital assets, as changes to a policy can quickly have major positive or negative impacts on the market. Given the importance of lawmaking agencies to the crypto space, we’ve compiled an extensive list of some of the entities that play a role in determining blockchain’s future – especially as it relates to those of us in the United States. 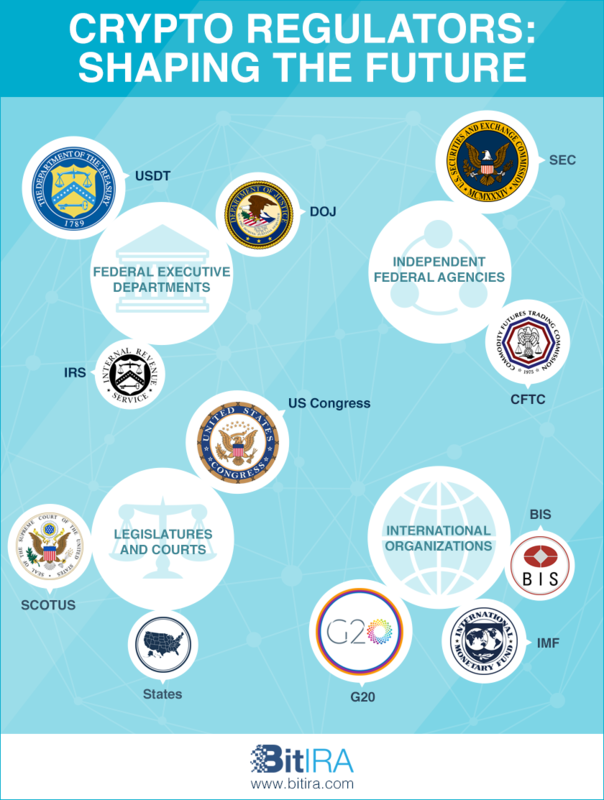 The 11 regulators on our list range from U.S. agencies, such as the SEC and CFTC, to large international organizations like the G20 and the IMF. Although not all of these entities actually create the regulations themselves, they nevertheless all have a significant impact on how cryptocurrency is regulated overall through either their rulings, actions, or influence. Each of them could play a significant role in shaping the trajectory of digital currencies moving forward. Want to see the history of Crypto Regulations from 2012 to 2018, jump down below. Role: The Securities and Exchange Commission has been tasked with overseeing the trading of various assets on the market since 1934. Having previously focused on stocks and bonds, the SEC recently added cryptocurrencies to its purview. Regulating U.S. exchanges is one of the agency’s main objectives. Jurisdiction: The SEC’s reach is considerable: the agency has the power to introduce less or more stringent laws regarding cryptocurrencies, take legal action against fraudulent individuals or companies, prevent launches of dubious ICOs and more. Regulations: While the agency hasn’t really introduced new laws to the crypto space, their optimistic testimony before the Senate in February 2018 gave a quick boost to the crypto market. Their designation of cryptocurrencies as securities has also been a major talking point. In the future, the SEC is likely to keep its focus on launches of new coins, so that ICOs follow the same standards expected of stock offerings. Challenges: SEC actions have shown that the agency wants to avoid over-regulating cryptocurrencies, especially given how new this technology is. The organization’s goal is to find the right balance point between allowing free trade and subduing suspicious activity. Significance: The SEC is becoming more vigilant in its efforts to clean up the digital currency space, which decreases the incentive for fraudsters to treat the crypto market as a cash-grab scam. While honest investors might not have a lot to worry about regarding the agency’s impact on the market, the SEC did indicate it wants to apply the whole spectrum of securities laws to both physical and virtual aspects of the crypto market. Role: Whereas the SEC focuses on various securities traded in the U.S., the Commodity Futures Trading Commission has dealt in derivatives of tangible assets since 1975. Because of their shared role of preventing risk and preserving market health, the SEC and the CFTC are often mentioned in the same breath. Jurisdiction: Since the CFTC is almost a sister agency to the SEC, it likewise holds a great deal of power over its corresponding markets (i.e., futures and options). Depending on their scope and extent, future CFTC regulations could have a significant impact on crypto trade, especially in how the SEC and CFTC define virtual currency. Regulations: In March 2018, a federal judge ruled that digital assets should be viewed as commodities and hence can be regulated by the CFTC. Since then, the agency has exercised a mild approach to the market, mostly providing instructions to exchanges and similar entities launching cryptocurrency derivatives. The approval of bitcoin-backed futures and derivatives in the U.S. remains the CFTC’s biggest decision within the crypto space. Challenges: The similar agendas of the SEC and the CFTC suggest that both agencies are committed (at least at this point) to fostering free and sound markets. Like the SEC, the CFTC has tried to avoid encumbering the crypto market and also makes efforts to increase general knowledge among investors about cryptocurrency. Significance: If applied reasonably, CFTC regulations stand to improve market conditions without harming growth in the sector. The CFTC’s seeming inclination toward cryptocurrency has been of particular note for participants, as key officials within the agency have openly lauded digital assets and their potential. Role: Formed in 1798, the Department of the Treasury has been the key monetary entity in the U.S., as it controls the production of both paper money and bullion. Some of the USDT’s other responsibilities include tax collection (through its bureau, the IRS), handling of debt, and forex regulation. Jurisdiction: Being directly responsible for the country’s flow of money, the USDT’s policies and decisions regarding cryptocurrencies could make sweeping changes to the market, although its interference has been minimal so far. Regulations: Treasury Secretary Steven Mnuchin expressed concerns regarding Bitcoin’s potential for misuse, stating that he will do everything in his power to prevent cryptocurrencies from being used illegally. The Financial Crimes Enforcement Network (FinCEN) bureau of the Treasury also made crypto exchanges subject to the Bank Secrecy Act in order to prevent money laundering and other criminal dealings. Challenges: Coordination with other U.S. agencies has been one of the Treasury’s biggest challenges with regard to cryptocurrencies. Besides working with the SEC and the CFTC, Treasury officials will also have to coordinate with the Federal Reserve regarding any new regulation that could take place. Significance: Despite Mnuchin’s comments on cryptocurrency abuse, the Secretary nonetheless sparked optimism in the community by entertaining the idea of a digital dollar. Although some have called for stricter regulations on crypto assets, Mnuchin appears satisfied with the current set of laws regarding general trade. Role: Established in 1870, the U.S. Department of Justice is the nation’s federal law-enforcement agency. The DOJ is tasked with enforcing the law, including prosecuting financial crimes. Jurisdiction: The DOJ has the authority to launch a probe into any questionable activity in the crypto space and take appropriate action as needed. In general, the agency has powers to prevent crypto-related crimes and fraud in the U.S. Regulations: So far, the DOJ’s foray into the crypto space has revolved around an investigation into several illicit market-manipulation tactics, such as influencing prices through large volumes of fake orders. While the agency isn’t directly responsible for regulating cryptocurrencies, it is the enforcement arm of the federal government to investigate and prosecute financial crimes. Challenges: As the enforcement arm of the law, the DOJ doesn’t necessarily have much say about how cryptocurrencies are defined or regulated – the department just administers justice based on laws passed by others. Its unique challenge is currently to find ways that illicit, anonymous, and decentralized transactions on the blockchain can be traced back to the criminals involved in such transactions. Significance: As is the case with the SEC and the CFTC, the DOJ has the potential to clean up the cryptocurrency market by making scams more difficult to pull off. While other government entities actually create the regulations, the DOJ, in practice, can decide on the amount of time, energy, and resources that are devoted to prosecuting crypto crimes. Role: The federal government’s Internal Revenue Service was established in 1862 and has since dealt primarily with collecting income taxes. The IRS frequently works in conjunction with other agencies and governing bodies, whether it’s to handle special cases or get to the bottom of illegally-obtained holdings. Jurisdiction: Because tax evasion is a criminal offense in the U.S., the IRS can indirectly file criminal charges against those looking to evade income tax laws. Therefore, all U.S. citizens are under the agency’s direct authority. Regulations: While the term “cryptocurrency” has become ubiquitous when referencing blockchain-powered assets, the IRS nonetheless declared that digital assets don’t fall under the umbrella of real currencies and should instead be regulated as property. 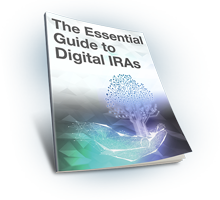 Although the designation has since accrued criticism, the IRS has stuck by its initial assessment made in 2014. Challenges: The inherent anonymity associated with cryptocurrencies has raised concerns among IRS officials that crypto traders may feel compelled not to report their gains. Significance: The taxation model applied to cryptocurrencies has made U.S.-based crypto dealings complicated for individuals, as each market participant is required to track gains so that they can be taxed. Crypto investors were further stressed when the IRS ordered Coinbase, one of the largest digital currency platforms, to hand over the details of 14,000 of its users in February 2018 in order to check their records for tax evasion. Role: Created alongside the Constitution in 1789, the Congress’s purpose is to pass laws that apply to all 50 states. Jurisdiction: The authority of the U.S. Congress is only matched by the President and the Supreme Court. As such, Congress has the power to steer the course for cryptocurrencies in the U.S. by passing or rejecting bills that define what cryptocurrencies are and how they can be used. Regulations: Congress, though wielding perhaps the greatest influence over cryptocurrencies, has few if any members that are experts on blockchain technology. Congress has not yet passed any wide-ranging laws covering crypto but has instead relied on the expertise of relevant federal agencies to define and regulate digital currencies as new types of familiar categories (securities, commodities, and property). Challenges: Like other governing agencies, U.S. Congress faces the challenge of figuring out how to regulate cryptocurrencies without impeding the market or the technology. If illegal activity in the crypto space is blown out of proportion in the media, it’s possible that members of Congress could pass blanket bans that would hurt the majority of productive crypto companies. Significance: Past congressional hearings have seen members divided on the topic of crypto, with some concerned over fraud and criminal activity and others intent on allowing the crypto market to develop or thrive. While there has been an absence of regulations regarding digital currencies so far, the passage of any bill involving crypto assets would likely translate to a sizeable impact on the market. Role: Shortly after its inception in 1789, the Supreme Court of the United States, or SCOTUS, has been the ultimate authority in interpreting laws passed by Congress. SCOTUS can declare laws unconstitutional and has the final say on rulings from the lower courts that have been called into question and appealed. Jurisdiction: Relatively few cases make it to the Supreme Court, and the nine justices who serve there are unlikely to be experts in blockchain. Since SCOTUS is concerned primarily with issues of legality, its decisions will probably not be as concerned with the long-term growth of the crypto sector. Regulations: The first mention of cryptocurrency in a Supreme Court decision took place in June 2018 in the case, Wisconsin Central Ltd. v. United States. Though crypto received just a tangential reference there, many in the space interpreted it favorably because Justice Stephen Breyer mentioned digital currencies in the context of a discussion about a “broader understanding” of what money is. Challenges: Congress, in policing cryptocurrencies, has largely relied on existing regulations originally on the books for other types of assets. Because of this, there will likely be cases before SCOTUS directly related to cryptocurrencies as federal regulatory agencies (like the SEC and CFTC) come into conflict over who has jurisdiction over this new and undefined assets class. Significance: There has been almost no interference from SCOTUS in cryptocurrencies thus far, and the trend is likely to continue even as the crypto market booms. However, comments made and endorsed by several Justices in a recent ruling suggested that the court is open to interpreting Bitcoin as a true currency, rather than just strictly a security or commodity. Role: Each of the 50 state governments in the U.S. can formulate individual policies based on the desires of their citizens. Therefore, laws can vary greatly from state to state, and practices that are illegal in one state could be allowed in another. Jurisdiction: Theoretically, a state government has great power to influence how cryptocurrency is defined and used within its borders. In practice, though, cryptocurrencies are such a “borderless” asset class that the federal government, tasked with regulating interstate commerce, will likely decide the policy regarding cryptocurrencies in the long run. Regulations: Currently, because of the absence of federal regulations regarding cryptocurrencies, each state has been left to construct its own laws on the matter. Numerous states have already passed favorable legislation that promotes the use of digital assets, with some also motioning to introduce blockchain technology to various levels of government. Challenges: Some state governments may potentially hinder cryptocurrency use within their borders if perceived downsides to crypto (e.g., money laundering for criminal activity) seem to outweigh the benefits of digital currencies in their state. Striking a balance between enforcing the law and fostering innovation will also be key for state governments. Significance: While some states have attempted to introduce crypto regulations in their area, most have focused on defining cryptocurrencies within the law. Another concern for state and local governments is energy consumption due to cryptocurrency mining – some cities have cracked down on this and sent crypto miners elsewhere. Role: The annual meeting of the world’s 20 strongest economies has, since 1999, served as a way for countries to collaborate and coordinate regarding important issues. While the meeting will sometimes focus on individual countries, an idea presented at the G20 can translate to a new set of regulations for each of the attending countries. Jurisdiction: The G20 is a forum for nations to discuss financial and other issues. It lacks a formal charter and has no regulatory power, but the soft influence that G20 meetings can yield may impact cryptocurrency policy in member countries and even in the United States. Challenges: International forums like the G20 present an opportunity for countries to consider cryptocurrencies’ broader effects on worldwide markets. Even if beneficial multinational policies are identified, though, the G20’s lack of enforcement powers may find recommendations falling on deaf ears if the advice goes against individual nations’ interests. Significance: The FSB’s ruling was seen as a victory for cryptocurrencies as a whole, since a different decree could have led to most or all member countries imposing regulations on the space. The absence of overwhelmingly negative discourse at the latest meetings has facilitated crypto’s relative freedom to develop as a market worldwide. Role: Although its policy has changed since its inception in 1945, the International Monetary Fund nonetheless retains its role as an overseeing body for each of the world’s economies. Besides providing loans to countries under crisis, the IMF also studies market movements and attempts to coordinate the global economy. Jurisdiction: The IMF exercises considerable power over independent economies and can effectively force countries (especially less powerful ones) to alter their policies and laws. Barring a substantial crisis with cryptocurrencies at the center, though, the IMF is unlikely to wield a heavy hand in crypto markets. Regulations: The IMF’s latest annual report found that crypto assets aren’t a global risk and therefore do not require intervention by the organization. The IMF went on to say that its involvement in cryptocurrencies would largely consist of providing advice to individual countries. Challenges: If cryptocurrencies begin to disrupt the financial system in the future, the IMF will have to ensure that nations are meeting their monetary obligations to one another and that policies are put in place to ensure the stability of monetary markets worldwide. Significance: Because of the IMF’s size and reach, even the slightest comments by officials can make a big difference to the crypto market. IMF chief Christine Lagarde has previously written about cryptocurrencies, listing what she perceives to be the positives (and negatives) of blockchain technology. Following Lagarde’s praise, prices of digital assets nudged up, showing that market participants are keeping a close eye on the IMF’s stance regarding crypto. Role: The global conglomerate of central banks known as the Bank of International Settlements, or BIS, ranks as the oldest global financial institution. Created in 1930, the bank’s purpose and actions are not dissimilar to those of the IMF, with a special focus on aligning the various elements in global finance. Jurisdiction: While the BIS has plenty of monetary influence in each country, it doesn’t really issue regulations and instead tries to assist various central banks with their governing of finance. As the banker for the central banks, it does set certain international standards and can indirectly pressure countries to follow certain policies. Regulations: In recent comments about cryptocurrencies, the BIS has been more critical than other international financial organizations. BIS chiefs are primarily concerned with the question of whether central banks should issue their own digital currencies (called CBDCs) – they say it could threaten the global financial system. Challenges: In a sense, organizations like the BIS are the antithesis of what many blockchain advocates see as the promise of cryptocurrency – while central banks are highly centralized and governed by elites, cryptocurrency markets are decentralized and open to everyone. The BIS needs to balance its mandate of supporting economic stability with an openness to technological innovation (and hence long-term economic growth). Significance: The BIS and its chairman, Agustín Carstens, have been among the most notable crypto critics, urging investors to place their faith in established fiat money instead of a wholly new development. However, past kindling the disapproval of crypto enthusiasts, BIS discourse on cryptocurrencies has had little negative impact on the market, nor has it really motivated countries to tighten their regulations of the space. The eleven organizations listed above are some of the primary entities that will influence how cryptocurrency is defined, regulated, and policed in the future. But there are others as well not mentioned here. These include the Federal Reserve, which may even one day issue its own cryptocurrency, and the World Bank, which has a function similar to that of the IMF or BIS (see recent comments by its chief). Also, the Financial Crimes Enforcement Network (FinCEN) classifies cryptocurrencies as money, and the Consumer Financial Protection Bureau (CFPB) has formed a “regulatory sandbox” to study financial innovations like cryptocurrency. Though decentralized and anonymous transactions on the blockchain are one of the major appeals of digital currencies, it’s nevertheless likely that the ultimate fate of cryptocurrency may be decided by entities that are themselves established and centralized.